Surfers for West Papua helps to organise gatherings of supporters, including of the surf film Isolated that documents the secret genocide in surfer paradise, West Papua. It educates the surfing community about West Papua and provides news, ideas and info about ways surfers can get involved with helping the freedom struggle. It sells merchandise such as S4WP T-Shirts, board-stickers, surf wax and board-shorts with all the proceeds going to help the movement grow. If you would like to get on board with Surfers for West Papua, please visit their official Facebook Page and checkout the online Surfers for West Papua store too. The Free West Papua message is reaching all parts of society and everyone from all backgrounds can get involved with the movement! 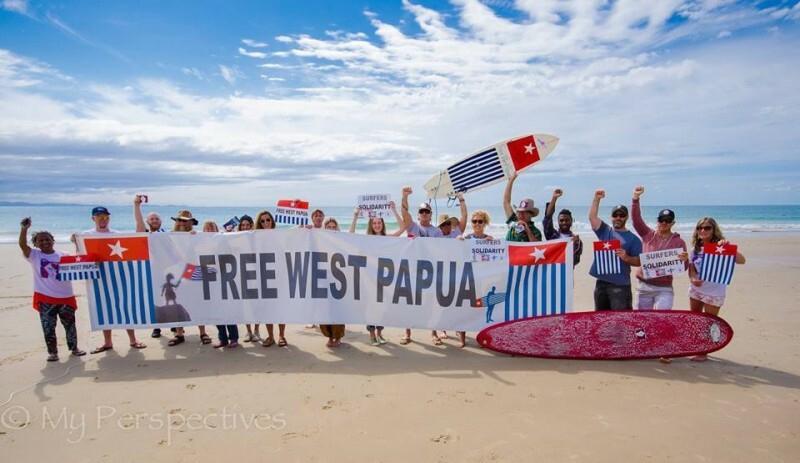 We hope as many surfers as possible will all get on board with Surfers for West Papua and join the global call to Free West Papua!